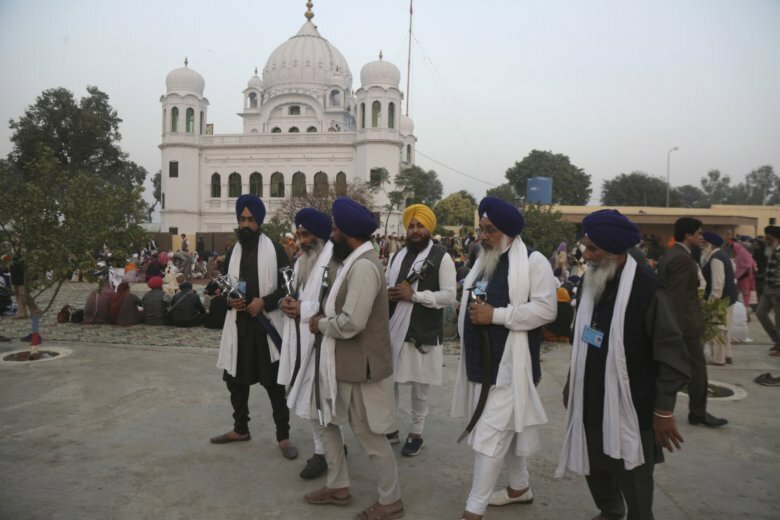 NEW DELHI (AP) — Officials from India and Pakistan met Thursday amid easing tensions to discuss opening a visa-free border crossing to allow pilgrims to easily visit a Sikh shrine just inside Pakistan. A Pakistani delegation crossed over to the Indian side of the land border at Wagah-Attari for the talks. Foreign Ministry spokesman Mohammad Faisal headed the Pakistani delegation. The Indian side was led by S.C.L. Das, a joint secretary in the Home Ministry. Instead of visas, the two countries plan to give special permits to devotees to access the shrine, the Gurdwara Darbar Sahib in Pakistan’s Narowal border district. India suggested that initially at least 5,000 pilgrims be allowed to visit the Sikh shrine every day. “We have also strongly urged them to allow the visit of pilgrims on all seven days a week,” the Press Trust of India news agency quoted Das as saying. Guru Nanak, the founder of the Sikh religion, settled in what is now Pakistan’s Kartarpur, where he spent the last 18 years of his life. The shrine was built after Guru Nanak died in the 16th century. The shrine is visible from the Indian side of the border. Sikhs often gather on bluffs to view the site from the Indian side. Thursday’s meeting was held “in a in a cordial environment” and the two sides agreed to meet again on April 2, according to a joint statement issued after the meeting. “Both sides held detailed and constructive discussions on various aspects and provisions of the proposed agreement and agreed to work toward expeditiously operationalizing the Kartarpur Sahib Corridor,” it said. It’s unclear how long the construction of a border corridor would take or when the crossing would actually open. Tensions between India and Pakistan flared last month after a suicide attack killed 40 Indian paramilitary soldiers in the Indian-controlled portion of Kashmir. The Indian air force launched an airstrike inside Pakistan, saying it was targeting militants it blamed for the bombing. Pakistan retaliated and said it shot down two Indian air force planes. One pilot was captured and later released. India says it lost only one plane. Tensions have eased since.